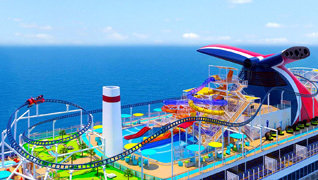 This new mega-ship has it all ... great fun, comfort, dining and tropical destinations. There's so much to do or you can do nothing at all ... it's all up to you! Carnival Horizon has more ways to play for your fun days at sea! Carnival features all-new ways to have a good time onboard, and continues to prove it with the outdoor fun of SportSquare, pedal above the sea in our two-lane suspended SkyRide course or head on over to WaterWorks onboard waterpark. The Carnival Multiplex features two movie theaters next door to one another, IMAX Theatre and Thrill Theater 3D. Escape to a world of relaxation at Cloud 9 Spa to unwind from the day’s excitement. Cabins are beautifully appointed and exceptionally comfortable! Havana Staterooms & Suites are located near the Havana Bar & Pool. Family Harbor Staterooms & Suites are found near the Family Harbor Lounge. Cloud 9 Spa Staterooms & Suites feature exclusive décor and in-room amenities. 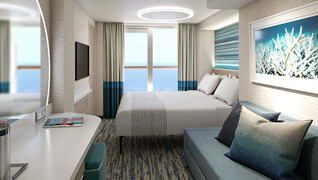 Interior Staterooms, Ocean View Staterooms, Balcony Staterooms & Suites feature a full private bathroom, complimentary 24-hour room service and linens you can feel at home in. 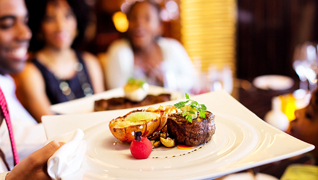 So many delicious dining choices to relish with friends and family! Carnival Horizon features Cucina del Capitano, which serves up Italian favorites fit for a captain. RedFrog Pub, with its laid back, not-a-worry-to-be-found atmosphere. Carnival even features fleet highlights Guy’s Burger Joint, BlueIguana Cantina, Alchemy Bar and RedFrog Rum Bar… plus the first-of-its kind Guy’s Pig & Anchor Bar-B-Que Smokehouse.